A hard-copy of this booklet will be shipped with your range, but it is available to read here online or for download. If you can’t see the preview below, or are having problems reading it, please click on Bienvenue download. This information is designed to aid you in the delivery, installation, use, and cleaning of your lovely, new Lacanche range. Our Bienvenue guide contains helpful hints as well as technical information that should be provided to your installer/contracting team. Additionally, it will help you identify the included accessories and parts with your new range, as well as their intended use or installation location. By reviewing this material, you will ensure a seamless transition from receiving your range to cooking and baking on your Lacanche in no time! Just like learning a foreign language, there can be a learning curve while familiarizing yourself with your new range. Don’t be afraid to practice by trial and error, while simultaneously pushing your culinary limits. With this in mind, have fun and bon appétit! The factory strives to meet your estimated completion date as much as possible. Our office will keep you updated with any changes on your ETA and will be in touch with you during the complete shipping process. The delivery company will contact you with at least 24-hours notice to set up exact date and specifics on delivery. Additionally, you will be notified by email when your range is in transit from France. Air Freight, expect 1–3 weeks to travel and clear US Customs for delivery. 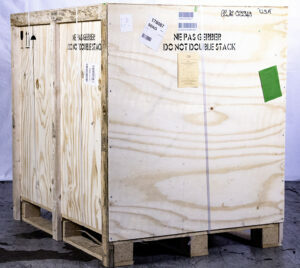 Sea Freight, expect 6–10 weeks to travel and clear US Customs for delivery. Our international freight forwarder—SEKO Worldwide—will be contacting you to make delivery arrangements. Make sure you are ready to accept delivery! If circumstances on your side prevent you from receiving your range as scheduled, there are two viable options: 1) storage with the freight company can be set up for a fee for a short period of time OR 2) if your schedule has been pushed back far enough, you may be able to switch from air freight to sea freight. Please contact Art Culinaire as soon as possible to see if this option is available to you. Curbside Delivery does not include installation. Due to the specific needs and site considerations for each project, we recommend utilizing your own building/remodeling crew and/or professionals that are familiar with your home and project needs. Your local gas supplier may have a list of recommended installers. The truck driver can only deliver your crated range to a flat sidewalk or driveway. Confirm that up to a 28-foot truck can access your house without any problems. If you anticipate any difficulty with a truck of this size, call Art Culinaire at 800-570-2433. Instructions can also be found online at www.frenchranges.com/uncrating. This information will save time (and money) for you and your crew. Please note: Because the freight company is not a moving service, delivery is only available to a flat sidewalk or driveway. On very rare occasion, major damage to the crate can occur during transit. If major damage is evident, you are not required to accept delivery. Please call Art Culinaire immediately at 800-570-2433. If minor damage is apparent to your crate, please let the driver go and uncrate the range (following the instructions on pages 8–9). Remove all plastic to inspect for damage or discrepancies and notify Art Culinaire immediately if damage has been found. If you intend to store your range for an extended period of time while your project progresses, please give us a call to discuss the uncrating/storage process. The freight company only allows seven days to report concealed freight damage. NOTE: Delivery is only available to a flat sidewalk or driveway. Important: Please read the following information carefully! Parts and accessories shipped with your range are inventoried at the factory, and once again during testing/inspection in the US. In the unlikely event that a part or accessory is missing, please report to support@frenchranges.com. Missing parts or accessories must be reported within 7 days of delivery to be covered under part warranty. A copy of the packing slip is included with the range. Until all items on your packing slip are accounted for, do not discard packaging Due to the large number of items that come with your range, it is recom- mended to keep all parts and accessories grouped together in a safe place so that they do not get lost. Storage of range/crate: Please note that the bottom of the pallet is not sealed. The range should be kept in a temperate, dry, pest-free Damage occurring to your range from improper storage is not covered under warranty. Dimensions below are of crates. *Due to the customizable nature of Lacanche ranges, as well as accessories purchased, these weights are approximate. NOTE: Make sure that you have enough people and proper equipment to physically lift the range. We recommend appliance dollies or a pair of Forearm Forklift™ arm straps to move the range. 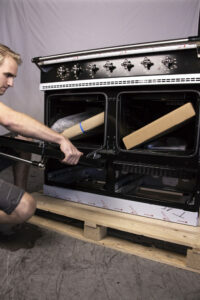 For information on uncrating your range, click here. Remove as much weight from the range as possible. Lighten the range by removing the storage drawers, and main oven doors. Also remove the toe kick. DO NOT REMOVE WARMING CUPBOARD OR VERTICAL CONVECTION DOORS. Lift with your knees. Practice safe lifting habits. The range should be placed directly in front of the range alcove. Each range is tested and tuned at the factory, but may need to be “localized” after installation, due to elevation, gas pressure, and gas compound mixture differences. Complete the following steps for optimal results. FUEL: Ensure proper gas line size and gas pressure. Gas line size must be large enough to supply sufficient flow rate for maximum BTU output for the range. It will NOT FUNCTION PROPERLY if supplied with more than 1⁄2 (0.5) psi. Range fuel manifold pressure must dynamically test @ 6” WC for NatGas, 10” WC for LP See video: www.frenchranges.com/gasconnection. POWER: These ranges require a 240v, 4 wire power supply @ various Amper- ages (See com/power). Ensure proper installation of the power cord to terminal block connections on the back of the range. All terminal con- nections and jumper brackets must be properly placed and tight. No loose connections. A power cord has been installed by the importer/distributor. DO NOT remove this cord. See video: www.frenchranges.com/electricalconnection. MANDATORY BACK SPACER: Measure and install a Back Please see frenchranges.com/support/range-spacer. VENTILATION: The range should be installed under an exhaust Please consult the Lacanche Ventilation Guidelines online. See video: www.frenchranges.com/ventilation. MOVE THE RANGE INTO POSITION: The range is equipped with nylon roller feet that may assist in moving the range straight back into position. Raise or lower these roller feet by manipulating the metal dowels hidden by the toekick. See video: frenchranges.com/levelrange. Check the proper operation of the top burner and gas oven valves and thermocouples. See video: frenchranges.com/ignition. RESET the Electric Oven “Safety” Reset switch for any Electric Oven or Cooktop Option if This electro-mechanical “Safety” can become partially tripped during transit or triggered by electrical surge at first power- up after installation. If you find that after proper installation everything seems to function except the Electric Oven, Plancha, Multi-Cooker, or Induction option then “Safeties” for each may have been tripped. See video: www.frenchranges.com/ovenreset. Level your If you do not have a bar level; on the most center grate, place an oil lined flat skillet with a 1/2 tsp puddle of water inside to help find level and center. See video: www.frenchranges.com/levelrange. Adjust air/fuel mixture by manipulating the air collar on each See video: www.frenchranges.com/aircollar. Adjust the low-flame for each See video: www.frenchranges.com/lowflame. Are Your Ready to Install? 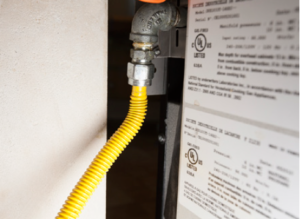 NOTE: Range installation should be performed by a licensed and bonded electrician or gas plumber. STEP 1: Ensure proper cabinet preparation. Cabinet preparation diagrams are available at www.frenchranges. com/support in the cabinet preparation section of the installation manuals. STEP 2: Are the electrical specs and gas rough-in correct? All Lacanche ranges require a 240 volt, 4-wire power supply at/above the rated amperage of the range, and a natural gas or liquid propane (LP) fuel supply input pressure at 0.5psi. Work should be performed by a licensed and bonded electrician or gas plumber familiar with your local code requirements. STEP 3: Do you have the proper hood and ventilation system? Outer hood dimensions and proper mounting height, as well as application specific ventilation requirements, can be found at www.frenchranges. com/support. Always refer to your local HVAC technician/contractor for your unique range installation. STEP 4: What type of wall spacer do you want? Find the most current spacer options information at: www.frenchranges. com/range-spacer. STEP 5: How high will the range need to be for final installation? 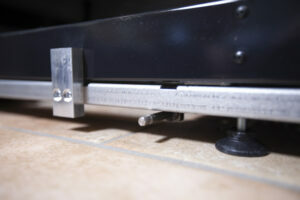 Extended leveling feet, or building a“stage” for the range may be necessary. The Lacanche ranges are equipped with height adjustable rollers that lift the range an extra 5/8”. 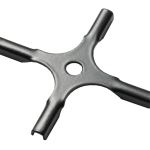 The built-in range roller feet have a minimum of  7mm hex adjustment rods that are hidden by the range toekick. The toekick is removed by pulling up on the attachment pins along the to edge of the toekick panel. Some doors and drawers may need to be removed first. The weight of the range should be taken off of the roller feet when adjusting. We suggest using wooden wedges or blocks under the base plinth to support the range during the adjustment. If the range must be raised higher, it is suggested to use the extended leveling feet (shipped with the range), or a flat stage or platform at the exact width and depth of the range footprint to act as a stable base. Decorative trim can be used at the front edge of this stage/platform and be painted or stained to match the cabinetry. STEP 6: Install the Anti-Tip Bracket behind the range. The anti-tip bracket is required by code and is designed to prevent the accidental tipping forward of the range. Please see next page for installation instructions. 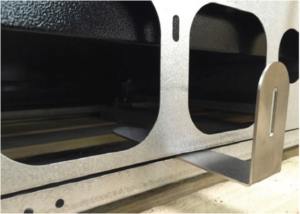 The Anti-tip bracket is designed to fit into the seam formed at the bottom of the range chassis and base plinth as shown below. The bracket can be mounted anywhere along the seam that the bracket can be freely inserted as shown below. It is recommended to mount the anti-tip bracket adjacent to the large rear cutouts in the back of the range located in the storage drawer cavity (excluding the Rully Model). This will allow for access while adjusting and installing. This bracket is designed to be mounted to a load bearing support, such as a wall stud. This anti-tip device is designed to only prevent the accidental tipping forward of the range. Depending on the state, municipality local code may require additional strapping of the appliance to prevent movement in seismic events. 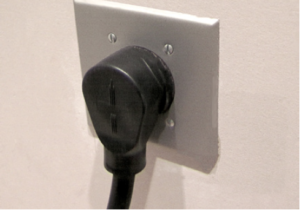 Plug the range into the power outlet. DO NOT remove this power cord. Removal of power cord may result in additional service expenses. for your range listed on the UL nameplate on rear of range or on bottom of drawer box. Please see the white UL stickers on the back of the range for BTU output or underneath the storage drawers. Raise the range to the height of the counter- top. 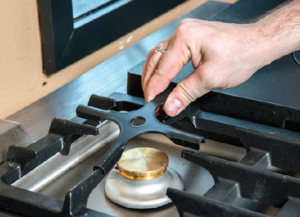 Then install proper range spacer behind range cooktop. Please see frenchranges.com/ range-spacer. Roll range backwards into place. Raise the range to the height of countertop and level the range when it is in its final resting position. Range cooktop must be flush or above adjacent countertop height. Now that you have both your wall spacer and range installed, we have provided the following tips to ensure that you set up your range and its parts correctly. 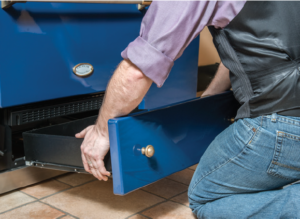 Drawers can be removed on your Lacanche range by fully extending and lifting off of the positioning pegs. To re-install, slide the back edge of the drawer in, first making sure to engage the rear alignment dowels, then lowering the front edge onto the guide pins at the front. Make sure the drawer closes smoothly and is aligned correctly. Failing to align the drawer properly onto the alignment dowels or positioning pegs can cause the drawer to contact the adjacent surface, resulting in potential chipping or damage to the enamel. There are four sizes of burner assemblies (caps and bowls): 18,000, 15,000, 11,000, and 5,000. The physical size of the burner corresponds directly to their BTU output in order from largest to smallest. 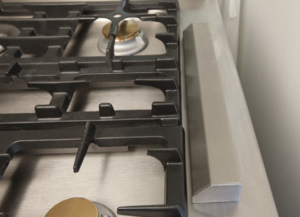 Each burner is paired with its range top counterpart. The easiest way to tell where to place the burner assembly is by the size of the cutout. Place oven rack in each main oven. The back bar of the oven rack should be at the rear of the oven. Vertical Convection Oven Racks – Insert these oven racks in the same manner as the standard oven racks with back bar at rear of oven. Warming Cupboard Oven Racks – The oven racks simply slide into one of the six rack positions. 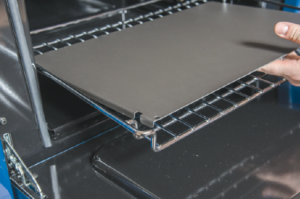 Pastry Sheet – Interlocks onto the top of the oven racks as shown. 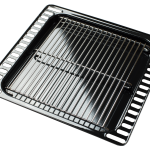 Drip Tray – Also interlocks onto the oven rack with the metal prongs straddling the base of the drip tray. Broiler Insert – Sits inside the drip tray as shown. Only applicable to ranges with an electric oven. Grates – Place grates in corresponding position as shown. French Top – (some ranges only) There are three exhaust ports (two on the sides and one in the rear). The rear exhaust port should sit in the back. Reducing Trivets – Sits directly over a side burner for smaller pots to rest. Oven Vent Covers – These stainless triangular clip-in vent covers are reversible and prevent spills from entering the cutouts at the back of the cooktop or to direct the exhaust flow toward a wall or away from guests in an island application. 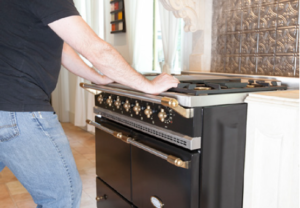 All Lacanche ranges are equipped with thermocouple technology, a child- proof safety feature. In fact, they are adult-proof if the operation is not learned and practiced. 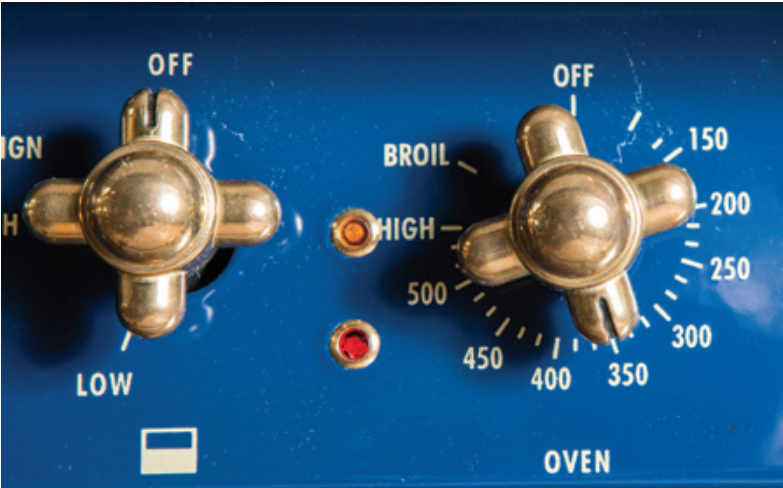 Only a heated thermocouple will allow your range to work safely and properly. active use, this will take approximately 5–10 seconds. Once safety thermo- couple is fully heated, rotate knob counterclockwise to desired temperature. a temperature marking, the knob will not need to be pressed in to make adjustments. *Note: If using the gas oven for the first time after installation, you will need to purge the fuel lines of air before the burners/oven will ignite. This will take up to 2 minutes. The handle must be fully depressed for this period of time at the “IGN” position. Rotate knob clockwise directly to desired temperature. Move knob one notch past “HIGH” for “BROIL” setting. As a general rule, give the electric oven a full 30 minutes to preheat to 350°. The red indicator light shows that the oven is ON. The amber indicator light shows that the heating elements are turned on. The amber light does not indicate that the oven is fully preheated and may come back on through the cooking process. To Turn Off: Rotate the knob counter-clockwise ONLY to the “OFF” position. Never move knob between off & broil positions. *Note: If you find that after proper installation everything seems to function except the electric oven, the safety may have been tripped. See Electric Oven Reset Video here. in the center and radiating outward to the edges of the plate. The French cooktop is not practical for cooking one-pot meals, but was designed to accommodate several pots, cooking at different temperatures at the same time. It is not intended to be a direct cooking surface for food. Due to the density of the cast iron, fully heating a French Plate takes 15 to 20 minutes. By simply removing the central “manhole cover”, you can have access to the direct flame below & utilize the provided wok ring for open- flame cooking. Preparing food on a French cooktop is not for the mild-mannered. Depend- ing on the cookware’s size, the French top can hold a pot of boiling water for pasta, a saucepan of gently warming tomato sauce, and a double-boiler of slowly melting chocolate – all at the same time. Each area of a cast-iron cooktop radiates different intensities of heat, making the French cooktop a popular command center for the busiest restaurant or kitchen. Rapid boiling on the central ring is ideal for pasta or when used for the first stages of making your own soup. Radiating out from the center, space is available to place pots that need a low boil, such as during the second stage of your soup. Go farther away from the flame to gently simmer sauces and finally, at the edge, melt butter or chocolate without burning them. 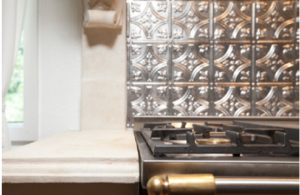 Maintenance – The French cooktop is sparkly and clean when first installed. After several uses, the sparkle begins to disappear, and cooking stains dominate. 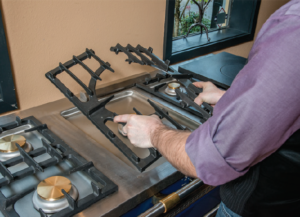 The cooktop is difficult to clean, prompting many owners to purchase our traditional plate cover to put into place when the cooktop is not in use. 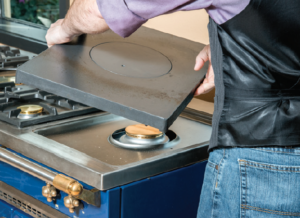 The cast-iron Portable Simmer Plate allows Lacanche range owners to enjoy the functionality of a French plate without it being a “built-in” cooktop option. To use, remove a pair of the side grates, and rest the portable simmering plate over a pair of the side burners. Just like the French Plate, the portable simmering plate will diffuse the heat of the burners to provide a softened, more gentle-tempered heating surface. You may use the portable simmering plate over a pair of similar-sized burners, or the combination of split-sized burners. By using one (or both) burners at a specific setting a corresponding heat gradient may be achieved. It is not intended to be a direct cooking surface for food. (Single burner heat diffusers) can also be used if you only need to simmer one pot/ dish. 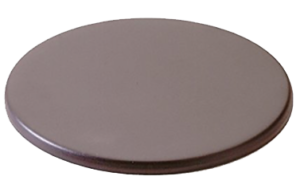 While we have single-burner aluminum diffusers available for purchase, you may also use the removable center plug from the French Plate if you have chosen the “Traditional” cooktop. *NOTE: This optional cooktop feature is non- removable and cannot be added after time of manufacture. The Plancha is a high-heat griddle option (made of chrome-plated steel), which is comparable to teppanyaki grills in Japa- nese restaurants. The design and high-heat features of the Plancha are ideal for searing meat, seafood, or vegetables and provides a very healthy way to prepare your family’s meals. Heat intensity can be easily adjusted. The Plancha is an electrically-powered direct cooking surface and will require oiling before each use, as well as between applications of food. This will help to avoid any sticking and to make the cleanup process easier. The Plancha is operated by the toggle switch below on the control panel. 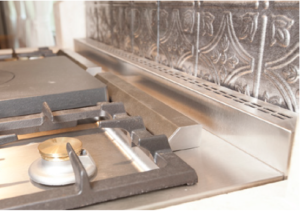 To achieve even-heating, turn on the Plancha at least 15-20 minutes prior to use. When done cooking, the Plancha will remain hot for an extended period of time (up to an hour or more depending on temperature). Do not put cover down until fully cool or may cause warping. To clean, while surface is warm (but not overly hot), use a pair of tongs and a few ice cubes or a rag that has been dipped in a vinegar solution, wipe the heated surface to remove initial food residue. Next, use the included scraper tool making sure to only scrape front to back to avoid gouging the surface. 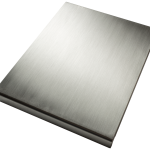 Note that the Plancha will naturally develop a worn look after repeated use. 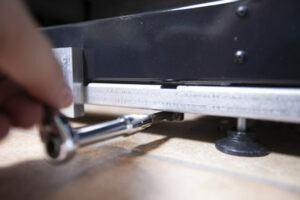 For a more thorough cleaning, we recommend the 3M Griddle cleaning sys- tem. It is food safe and achieves the best results. Follow the manufacturer’s directions and be careful not to burn yourself while using. Note: RESET the Electric Oven “Safety” Reset switch for any electric oven or cooktop option if necessary. This electro-mechanical “Safety” can become partially tripped during transit or triggered by electrical surge at first power-up after installation. If you find that after proper installation everything seems to function except the Electric Oven, Plancha, Multi-Cooker, or Induction option then “Safeties” for each may have been tripped. See Electric Oven Reset Video online. Lacanche offers a full range of accessories fitted specifically to your range and designed to enhance your cooking experience. The cast iron wok ring supports a large wok for stir frying. Design allows flame to envelop wok in a continuous wall of heat. Primarily intended for use above the large 18,000 BTU center burner on either the Classique or Traditional Hob, wok ring also allows use above a 15,000 BTU burner. The reducing trivet bridges the gap between the cooktop grates allowing the use of very small pots over side burners. One rolled-steel pastry sheet is included with each Lacanche oven. Pictured is a 15″x 15″ Cluny sheet on corresponding oven rack. Preferred by pastry chefs for their superior performance over aluminum, each pastry sheet allows even airflow around all sides. 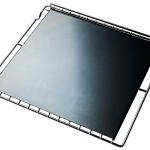 One 13″x 19″ steel pastry sheet is included with each Sully oven. A natural seasoning will eventually occur with use of included pastry sheets. NOTE: Additional pastry sheets may be purchased. 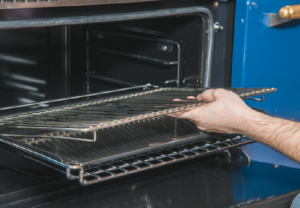 Two chrome-plated steel oven racks are included with each Lacanche oven. 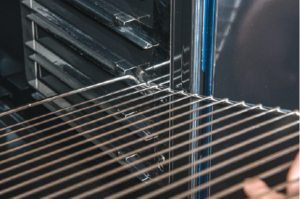 Rack design allows owners to remove dish-laden racks to “check and baste” accordingly. Safety-tip catch ensures rack is stopped prior to being over-extended. 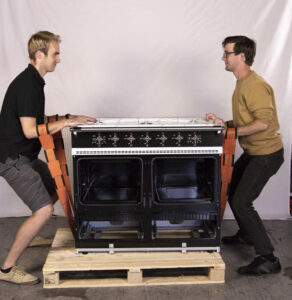 To accommodate large roasts, a fully extended bottom rack will rest securely on corresponding open oven door. for electric ovens only. 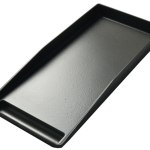 Pictured is the Sully-sized tray with chrome broiler insert. With the broiler insert in place, you are ready to “grill” (broil) inside your Lacanche electric (or convection) oven. The drip tray, when used separately, may be placed below any dish or pie-laden pastry sheet to catch spillovers. Used to separate meats from their drippings, you will be supplied with a chrome broiler insert for use in your Lacanche drip tray. Lacanche has manufactured optional accessories to optimize your cooking style and preferences. The following items can be purchased by Clicking Here. to your Lacanche grate. To ensure even heat across the surface, both burners are typically set to the same level. A three-sided trough and gentle slope allows for adequate runoff. 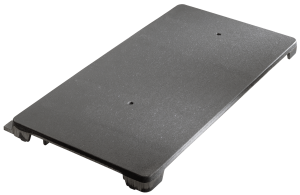 Griddle plate dimensions are 20”x 10 ¼”. * Items such as Pastry Sheets, Griddles and Grills should be properly seasoned prior to use to prevent sticking. The plancha is not intended to be seasoned in the same manner as these steps outline below. You can find more cleaning instructions here. Seasoning will require a high temperature/high smoke point oils are best (Peanut, Grape Seed, Sunflower, Canola Oil). For pastry sheets, wipe on an even, medium layer of oil using a cloth or paper towel. Preheat oven to 350°F. Turn ventilator fan on high. The seasoning process will create smoke. Place pastry sheet in the oven for 20 minutes, or until smoking stops. Apply a medium layer of oil using a cloth or paper towel. A basting brush can be used to distribute the oil in the grooves of the Grill plate. Heat the plate over the stove top burners on the medium setting with the ventilation fan on high. Continue heating until the smoking has stopped. Turn off burners and allow to cool. Do not soak. Light scrubbing with a mild soap and water solution is sufficient. 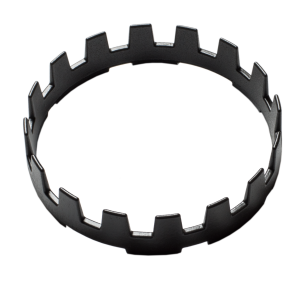 For grooved grill plate, a nylon bristle brush can be used to clean between the grooves. If food is sticking to a seasoned item, additional seasoning may be required. NOTE: Before cleaning, be sure to close the gas supply and/or isolate from the main electrical supply. The brass burner caps are shiny due to the machining process. Even though the cosmetic look is appealing, brass is ultimately chosen as a material for its durability and machinabil- ity. With normal use, the brass will lose its shine, become bronzed, and patina in appear- ance. 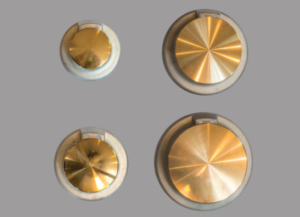 Over-polishing the brass caps is not recommended because performance may be affected and result in burner malfunction. Simply clean with a cloth using dish soap and water. In order to remove heavier, baked-on grease splatter, submerge the caps with tongs into boiling white vinegar for 10-15 seconds. After, you may polish the caps with Mother’s Mag & Aluminum Polish. Enameled steel burn- er cap covers are available as cosmetic covers for discolored brass burners. First clean the brass using soap and water, or glass cleaner. To remove heavier tarnish, grease, or other impurities, use a metal cleaner and polish, such as Mother’s Mag & Aluminum Polish. When polishing the towel bar-holders, and oven door bar-holders, you may use masking tape to protect the surrounding enamel. All stainless steel parts should be cleaned regularly with hot, soapy water or a neutral, non-abrasive detergent. To remove the haze left from this step of cleaning, use either a good stainless steel cleaner (Simple Green Stainless Steel Cleaner and ZEP are both good brands). Wiping with the grain will keep hazing and scratches less visible. To remove heavier or burnt-on contaminants from the range top, soak the range top in a degreaser or vinegar for 15-20 minutes, then using a fine- bristled nylon brush, scrub WITH THE GRAIN. Wipe clean and finish by using stainless steel cleaner on a clean rag. CAUTION: Do not use steel wool pads, abrasive cloths, abrasive cleaners or powders to clean. Do not use a metal knife, spatula, or any other metal tool to scrape stainless steel. Scratches are almost impossible to remove. Do not permit citrus or tomato juice or forms of brine (concentrations of salt, sauerkraut, etc.) to remain on the stainless steel surface, as citric acid or anything acidic will cause corrosion and permanently discolor stainless steel. Do not use any chlorinated cleansers (bleach of any kind) or ammonia to clean the stainless steel, as it will permanently discolor and rust. Use a sponge soaked in soapy water or a degreasing product applied with a soft cloth. A gentle, non-ammonia glass cleaner can be used on enamel surfaces if soap is not effective. CAUTION: Never use any abrasive cleaners. Avoid excessive or harsh rubbing when cleaning, which can leave permanent marks on the enamel. Do not allow any metal, cast iron, or brass polish/cleaners (Brasso, Copper Brite, Flitz, etc.) to come in contact with any enameled surfaces. The chemicals will cause permanent damage to the enameled finish. The above trim options are custom upgrades on a Lacanche range. If you did not order one of the above, your Lacanche has brass trim and should be cleaned accordingly or left alone to patina. The trim options on a range include the waist bar supports, oven door handle supports, temperature knobs and drawer pulls. The actual towel bar and oven door bars are always stainless steel. Wash all upgraded trim option parts with soap and water, then dry with a soft cloth. Aluminum Burner Buckets – For light soils, clean with dish soap, water and a sponge. For heavy soils, use a nylon bristle brush and a product called Bon Ami. 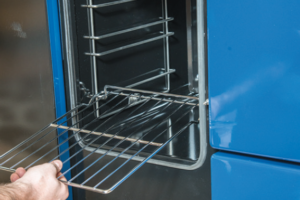 A standard oven cleaner can be used in any Lacanche oven. 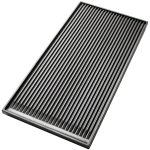 Clean the rear cover(s) (electric oven or fan-assisted oven) to ensure that the cooling louvers are not blocked with deposits. Do not spray cleaner directly through the louvers in the rear cover, or product will go onto your back wall. Spray the fume-free Easy-Off onto a towel and wipe accordingly. 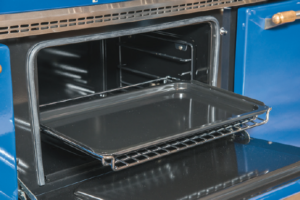 After cleaning, and before use, make sure that the base plate of the oven is properly mounted at rear and slid forward and fitted under the front edge of the oven in order to avoid deformation of the base due to heat. (The bottom base enamel panel has a slight torsional twist designed into it and will not lay flat when loose or removed — this is on purpose — it will be in compression when fitted properly). Grates – Using a brush or cleaning pad, wash with soap and water and then dry. 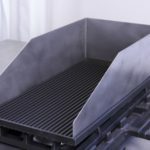 For more heavily soiled grates, degreaser or Easy-Off can be used. Avoid soaking grates in soap and water as it may weaken adhesive for rubber grate feet. Avoid using brush or cleaning pad directly on rubber feet to ensure they do not come off during cleaning. Grill/Griddle Plate—Cast Iron Plate with Treated Finish – Using a brush or cleaning pad, wash with soap and water and then dry. Even though these plates have a treated finish, a light “seasoning” of these cooking surfaces will make for easier cleaning and provide a good non-stick surface. However, seasoning is not required. *Only valid on residential-use ranges installed in accordance with the installation documentation and specifications. Although Lacanche ranges are designed with simplicity and longevity in mind, there will come a time when service is necessary. We maintain a na- tionwide service network. These service companies typically repair ranges only and do not handle installation unless otherwise noted. If you experi- ence an issue with your range within the warranty period, please contact our service department so that they can approve all repairs and issue any necessary parts. If you have a preferred service company with whom you are comfortable, our service team can work with them providing any techni- cal information or parts. We strive to make repairs as quick and easy for all of our owners and their beloved ranges. Lacanche ranges are considered to be timeless, and with care and repair, they will live on as the only heirloom grade appliance in your kitchen. To reach our service department, please send an email to support@ frenchranges.com or call (888)222-2930. NOTE: Please share this website with your contractor, architect, designer, and/or cabinetmaker. installation, etc. and many more instructions and resources! If you are unable to find the information you need online, please contact Art Culinaire at 888-222-2930 or support@frenchranges.com. Troubleshooting can often be performed over the phone or via email with a representative from our professional service staff. If the issue requires parts or labor, Art Culinaire will contact a service company in your area through our national service database or you may contact your local servicer directly. Art Culinaire maintains parts and supplies in our Woodinville, Washington warehouse, and can ship any needed items ASAP by FedEx/UPS. Occasionally, custom parts need to be ordered directly from the Lacanche factory in France.